Derx, J., Schijven, J., Sommer, R., Soufal-Hruza, C.M., Linke, R., Blaschke, A.P. and Farnleitner, A. 2019. The QRMAcatch approach for guiding sustainable water safety management options at a large river. In: J.B. Rose and B. Jiménez-Cisneros, (eds) Global Water Pathogen Project. http://www.waterpathogens.org (S. Petterson and G. Medema (eds) Part 5 Case Studies) http://www.waterpathogens.org/book/qrmacatch-approach-for-guiding-sustainable-water-safety-management Michigan State University, E. Lansing, MI, UNESCO. The QMRAcatch model to support microbial water safety management at urban RBF settings. Catchment-specific model calibration and verification with microbial source tracking data. Integrate QMRA with hydrological process modelling and pathogen emission scenarios. Identified sustainable requirements for safe drinking water production (SDG goal 6). Applicable for WSP but similarly for SSP, e.g., for irrigation from sewage polluted waters. The case study addresses high level experts and water supply managers. The objective was to determine the needed pathogen reductions during riverbank filtration (RBF) and final disinfection so that safe drinking water production can be guaranteed for the future. 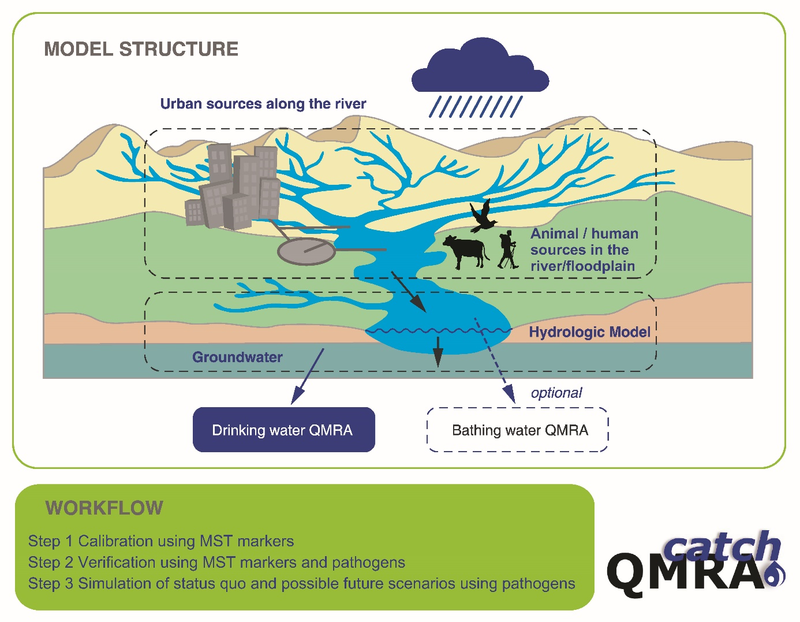 An approach integrating QMRA with hydrological process modelling that is driven by microbial source tracking (MST) and virus data is presented with the recently developed computational tool QMRAcatch (free download at: www.waterandhealth.at). The case study site is located at the Danube River in Austria and a river/floodplain area with important drinking water resources, serving also as important recreational area for the City of Vienna (300 thousand visitors per year). The study site can be regarded as a model area to study RBF systems in particular when conflicting land/resource utilisations do exist. Several municipalities located upstream of the study site discharge biologically treated wastewater into the Danube River that include sporadic combined sewer overflows. The urban drinking water is produced from a well series after treatment by the RBF system and additional disinfection. Besides the impact from the Danube River, visitors and wildlife faecal pollution have potential impact on the microbiological water quality in the floodplain area. The outcomes consist of the assessed faecal pollution burden and the needed virus reduction level by treatment of river source water to reach safe drinking water. Wastewater and pathogen emission risk scenarios for the studied site highlighted i) that further disinfection as an additional step after biological wastewater treatment would be the most powerful additional measure for environmental catchment protection, and ii) that the water treatment ensuring safe and sustainable drinking water production would require an 8 log reduction of virus load during RBF and final disinfection to be robust against a high-pollution scenario (i.e. wastewater treatment failure combined with infection disease outbreak). The Water Safety Plan criteria can be fulfilled following the presented approach based on best available site-specific information including human-associated MST and pathogen monitoring data. For applications in scarce-data areas stochastic modelling approaches are implemented which only require few information about the yearly river discharge and amount of rainfall. The Sanitation Safety Plan. The presented approach is also applicable for recreational water and irrigation. This paper was supported by project 23900-B22 granted to AHF and FWF (Vienna Doctoral Program on Water Resource Systems W1219-N22 ) and the GWRS project (Vienna Water) as part of the “(New) Danube-Lower Lobau Network Project” funded by the Government of Austria and Vienna, and the European Agricultural Fund for Rural Development (LE 07-13). This is a joint study effort of the ICC Water & Health (www.waterandhealth.at).